A few weeks ago, I had a post on the blog with homemade bread and a bitter orange marmalade. The same evening that I had made it, I had a vision about the marriage of the tastes marmalade, cashew nuts and chocolate. I had to try it! And it turned out really great, I just have to share it with you! The cake can ideally be kept in the freezer, ready to be cut in small bites whenever you get a sweet tooth. 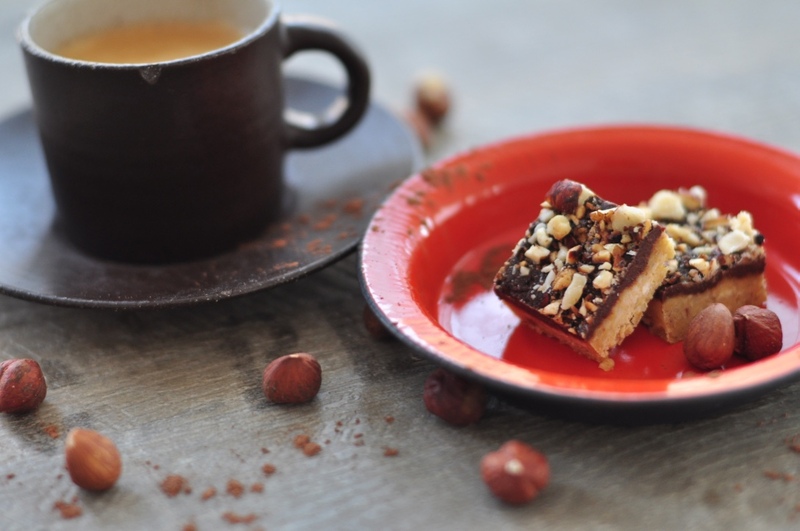 It tastes great with a strong espresso or a cup of tea. You need a 15×15 cm baking tray, baking paper and a mixer to be able to make this recipe. 1. Roast the hazelnuts in a dry skillet. Set aside to cool down. 2. Prepare a baking tray with baking paper. Cover the sides of the small baking tray as well. Set your mixer ready. 3. Add the cashew nuts, the single date and the marmalade to your mixer. Mix the ingredients until you have a smooth paste. Some visible pieces are nice for the final mouthfeel. 4. Spread the paste in the baking tray using your hands. Make it as evenly as possible. You might have to wet your hands slightly with lukewarm water to be able to make it. Set aside in the refrigerator while making layer 2. 5. Melt the coconut oil in a separate bowl. 6. Add the ingredients to layer 2 to your mixer. Mix until smooth and add then the coconut oil. Let the mixer combine everything until you have a equal paste. 7. Take out the baking tray with layer 1 and spread layer 2 on top using your hands. Again, you might have to wet your hands slightly with lukewarm water to be able to get a equal result. 8. 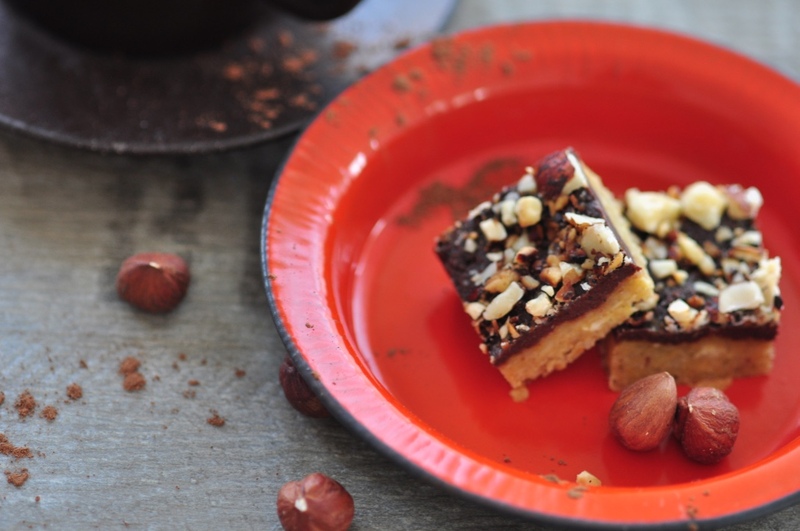 Chop you roasted hazelnuts and spread them on top of the cake. Press them down with the palm of your hand so that they really stick on the surface. 9. Place the cake in the freezer for at least 30 minutes. Cut in small squares when serving.